We are CJ Tables and Chairs , your one stop source for Commercial Furniture. 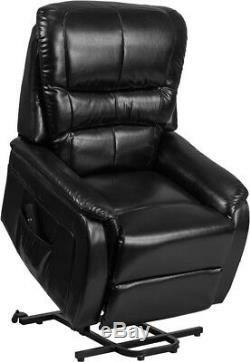 We have a huge inventory of over 1,000 Recliners available. Please contact customer service for more information. 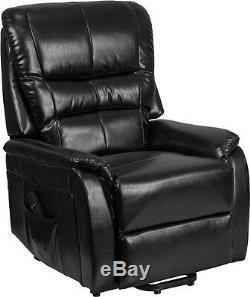 Contemporary Remote Powered Lift Recliner in Black Leathersoft with Side Pocket. 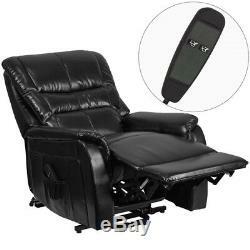 No longer think of lift chairs for someone who needs assistance, but as your relax destination chair. 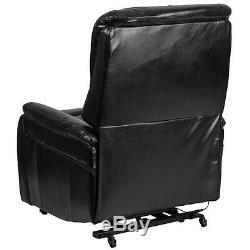 This recliner provides excellent comfort and support with generous padding throughout the chair. Power controls ease the transition between sitting and standing, and adjust the chair to meet your personalized lounging needs. LeatherSoft is leather and polyurethane for added Softness and Durability. Spot clean with solvent-based cleaner. Seat Size: 18''W x 21''D. Back Size: 29''W x 26''H. Arm Height From Floor: 23.25''H. Arm Height From Seat: 4''H. Overall Depth: 32 - 67''D. Overall Height: 44 - 57''H. 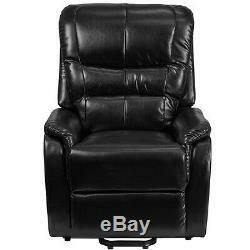 The item "Contemporary Remote Powered Lift Recliner in Black Leathersoft with Side Pocket" is in sale since Wednesday, August 16, 2017. This item is in the category "Home & Garden\Furniture\Chairs". The seller is "cj-commercial-furniture" and is located in Canton, Georgia.